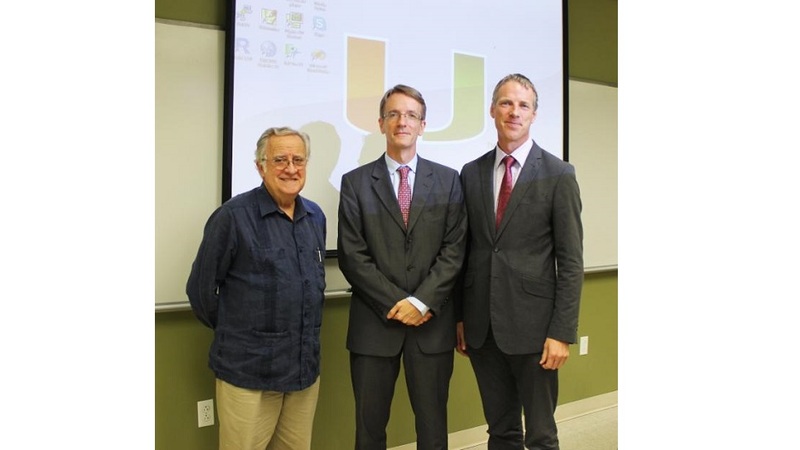 Phillipe Létriallart, General Consul of France, and David Prodger, General Consul of the United Kingdom, gave dual briefings on their respective government responses to the recent terrorist attack in Paris, France at an event hosted by the University of Miami College of Arts & Sciences’ European Union Center. The briefing, which took place on Dec. 8 on the Coral Gables campus, outlined the challenges involved in confronting terrorism faced by France and the United Kingdom as well as the strategies to counter the terrorist threat adopted by the two countries. Létriallart noted that France is confronted with two types of challenges. The first type is internal: How does France protect its democracy from the threat of terrorism while preserving and promoting republican values? The second type of challenge is external: What can be done to fix the problems in the Middle East that fuel terrorism? “Even if terrorism is horrendous, something unthinkable…even so, we have to understand the bigger picture, the history, and its context. Terrorism is another way to do politics; it’s not madness, even if it’s horrendous. It’s a way to gain power,” stressed Létriallart. ‌The French government’s response to the internal challenge has been to institute a state of emergency, a “very special measure…a restriction of freedoms in order to protect our freedoms,” said Létriallart. Additional measures include the monitoring of French nationals who travel to Syria and possibly prohibiting their return to France, increasing the resources devoted to intelligence and cyber defense, and promoting an education that fights discrimination, racism, and anti-Semitism. The French Consul highlighted that there are regional players in the Middle East that must play a stabilizing role for the region if the Middle East’s problems are to be solved. British Consul David Prodger’s talk also emphasized both the internal and external challenges posed by terrorism. The United Kingdom’s response to the recent attack in Paris has included a parliamentary vote for extending the UK’s air campaign into Syria (previously it had been restricted to terrorist targets in Iraq). Britain’s long-term strategy in the Middle East also emphasizes the eventual necessity of a rebuilding effort in Syria; the Islamic State of Iraq and Syria (ISIS, also known as Daesh, ISIL, and IS) economy needs to be dismantled, and it will be necessary to provide funding for reconstruction if Syria is to stabilize and attract the return of refugees that have fled the civil war. The fight against terrorism must include countering extremist ideology, but this is something that the British government, comprised largely of representatives of an Anglo-Christian background, cannot do alone. Consequently, the British government has adopted a two-pronged policy of prosecuting hate-speech propaganda while providing space, funding, and encouragement for moderate voices to counter the extremist ideology that fuels terrorism. Photo caption: Joaquín Roy, Jean Monnet Professor and Director of the European Union Center, with Phillipe Létriallart, General Consul of France, and David Prodger, General Consul of the United Kingdom.